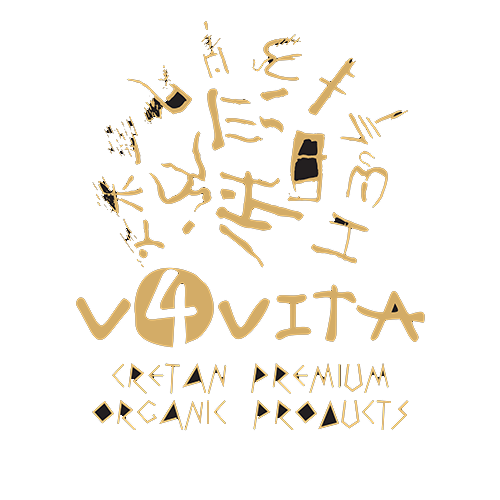 “v4vita is a family business which, following a tradition of lots of generations, was established by people with long experience in the production of pure Cretan products. Our long engagement in organic crops are by no means random. Very soon, the people of v4vita realized the value of Cretan diet and how important the consumption of fresh natural products is for our health. Our products are manufactured only with Cretan raw materials, without preservatives, without additives and, of course, they are certified organic. Today, in order to cover the needs of the market, v4vita cooperates with small volume manufacturers, making good use of the deep knowledge of its people, so as to be able to always offer pure, natural and certified products to consumers who seek high quality and incomparable taste. The aim of the company is to satisfy even the most demanding palates while remaining true to the principles and values of the Cretan diet, which is the capstone of the Mediterranean diet.